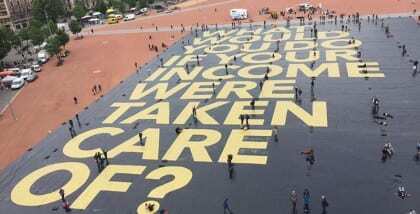 The Swiss campaigning for a basic income set world record on 14th May 2016 by unveiling the world’s largest poster. They laid out “The biggest Question on Earth” – on the largest ever printed poster – on the public square “Plaine de Plainpalais” in Geneva and were recognized by the official “Guinness Book of World Records”. The poster, which cost 200’000€ was entirely crowdfunded over the past server weeks. The poster was fabricated by the initiators and supporters of the Swiss Initiative for an Unconditional Basic Income who are also members of the Swiss campaign team. Contact UBI Campaign: Che Wagner, Basic Income Switzerland, international Spokesperson che.wagner@grundeinkommen.ch.